Following a very public shaming of Tiwa Savage by her husband Tunji Balogun aka Tee Billz where he accused Tiwa of infidelity, neglect and emotional abuse, abused her mother, threatened and later attempted suicide, Tiwa granted an explosive video interview to the press. In the interview, which occurred less than twenty-four hours after Tee Billz’s suicidal attempt, Tiwa pulls no punches. She accused Tee Billz of being a drug addict with his choice being cocaine, a deadbeat father, emotionally abusive, financially inept, adulterous, fathering a child out of wedlock, and claimed/insinuated he was wanted by Nigeria’s federal crime/prosecutorial agency, EFCC, for seemingly criminal activity involving a 45million Naira ($150-200,000) loan. She confirmed he in fact had mental health issues of which he had been receiving treatment but did not seem committed to treatment because he always quit half way through. She confirmed he in fact did try to commit suicide, and also that she was concerned her tell-all video would possibly trigger another attempt to hurt himself. She revealed she fired him as her manager because he was allegedly “stealing from her” and that is when all the issues really began. In addition, she claimed he was allegedly co-mingling personal and business funds and when she challenged him, he failed to see anything wrong about it and refused to change. She declared she was through with the marriage, did not want a divorce but was forced to get one given the circumstances. 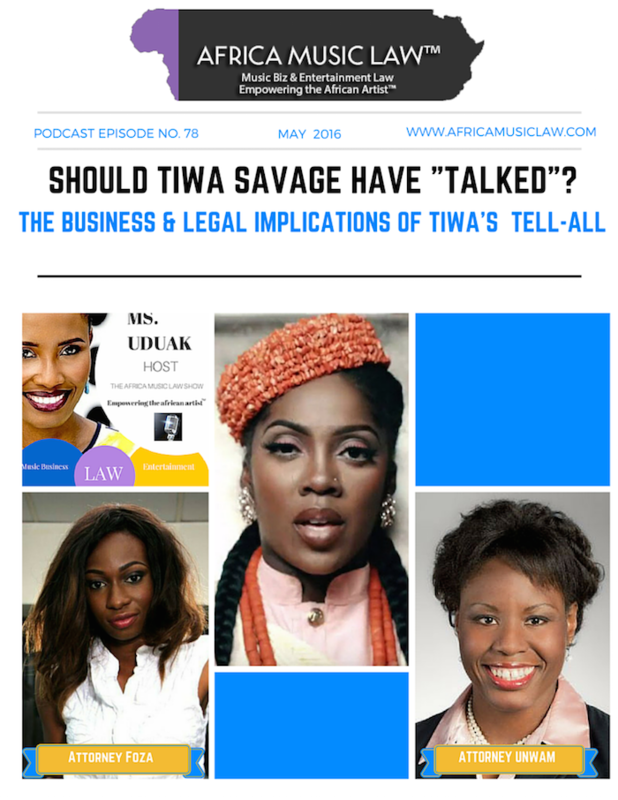 In this 78th episode, Ms. Uduak, host of The Africa Music Law Show, along with invited guests attorneys Unwam Oduok and Fawehinmi Oyinkansola take on Tiwa’s tell-all looking a the business and legal implications. The goal is to empower the average Nigerian/African artist with powerful business and legal education that hopefully ensures a stronger and sustainable entertainment industry. For an analysis on T-Billz’s statements and behavior, please visit episode 77 here. Unwam Oduok is an attorney and Partner at Ebitu Law Group, P.C based in Sacramento California where her practice areas focuses on family Law, business law(which includes contract drafting, negotiating and litigation), civil litigation and crisis management for brands, talents and businesses. Ms. Unwam is licensed to practice in California. She can be reached via email at (unwam@ebitulawgrp.com). Fawehinmi Oyinkansola is a founding partner at Legalbyte a boutique law firm servicing the creative industries in Nigeria. She heads the music, film and fashion portfolios of the firm. Oyinkansola popularly referred to as “Foza” has successfully pioneered the emergence of many revenue streams for consortium of producers for the publishing of their catalogues. She also played a pivotal role in daily management and administration of The Sarz Academy ; an NGO pioneered by Sarz (a top ranking music producer in Nigeria). Popularly known in the Telecommunications value added services, she has brokered many licensing and publishing deals for host of artists. Foza also doubles as a business manager for singer Chee. She can be reached via email (officialfoza@gmail.com) or on twitter: @fozadoza. Uduak Oduok, (Moderator) founder of Africa Music Law, is a Partner and Co-Founder of Ebitu Law Group, P.C. where she handle her firm’s intellectual property law, media, business, fashion and entertainment law practice areas. For fifteen years, as an attorney, she has litigated a wide variety of cases in California courts. She has also handled a variety of entertainment deals for clients in the USA, Africa and Asia including network television and licensing deals. Her work and contributions to the creative industry has been recognized by numerous organizations including the National Bar Association, and featured in prestigious legal publications in the USA: ABA Journal and The California Lawyer Magazine. She can be reached via email (uduak@ebitulawgrp.com) or on twitter: @uduaklaw. N45m is about $150,000 to $200,000. Great analysis.